The original Free Betty Ford Bridge. The following items were related to the need for and eventual build of the Free Betty Ford Bridge over Livingston Creek, connecting Crittenden and Lyon counties. 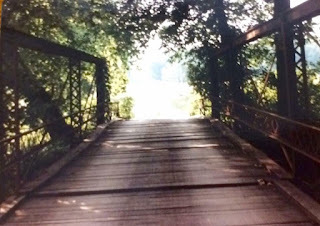 The original bridge was constructed in 1912 at a cost of $1,654. -Lyon county is making arrangements to erect her part of the bridge across the Livingston creek at the Free Betty Ford between this (Crittenden) and Lyon county. We hope now soon the bridge may be built for a bridge was never needed worse anywhere. -The farmers here pay their part of the taxes and have asked for but little in return, except good government and a law abiding citizenship. But now, they feel like asking the Lord to so wonderously revive the fiscal court that it was consider favorably a proposition to build a bridge across Free Betty ford. -Tobacco that was sold here to be delivered to Kuttawa, will have to be hauled by way of the iron bridge which is ten miles further than via Free Betty ford. Oh! how badly we need a bridge at Free Betty ford. -NOTICE TO MAP & CHART CLUB: The company than has been formed to go to Eddyville and haul home those promise maps and charts, will have to go by way of the iron bridge, for the Free Betty ford is impassable and will be until June. -The Cumberland river is rising rapidly and the backwater has reached Free Betty ford. -Jack Turley says that as he and J.C. Glenn were cleaning the mud out of Free Betty ford recently, they dug out the jaw bone of a man and four horse hoofs. See Jack and he will give you the particulars. -No bridges to be built in Crittenden for two years. Gee! What will we do here and at Free Betty Ford! Keep digging out jaw-bones I suppose. -As a certain young man and his sweetheart were crossing the creek at Free Betty Ford, a few evenings ago, their buggy dropped into the quicksand and threw them into a deep hole of water. They got out alive, but as they say, they came very nearly freezing as “it was a very cold night.” Mr. Magistrate if you had been that young man, you would vote for a bridge. -Will Pilant was plowing recently and his plow turned up a set of artificial teeth, the teeth and plate are in good condition. We can not imagine how they came here or whose they are, but many think that they belong to the poor fellow that lost his jaw-bone at the Free Betty ford. -The back-water has suspended travel across Free Betty ford. Oh! how badly we need a bridge. -Wonder when that committee is going to meet at Free Betty ford? Say, Mr. Yandell, why don’t you get busy? -If our Fiscal court will not give us a bridge across the creek at Free Betty ford, we would like to have the Lyon county line changed to begin at the Butler bridge near W.S. Rice’s and run from there on a straight line to the iron bridge on Claylick creek, thence with said creek to Cumberland river. Lyon county is willing to change its boundry [sic] to include us and build us a bridge. Wonder if we poor fellows down here will be granted this privilege? We are going to do our level best to get cut off and to be added to Lyon county if we can not get a bridge. There has been quite a demand by the people of Dycusburg and Frances precincts for a bridge at Dycusburg or Free Betty ford, to connect Crittenden with Lyon, and in recognition of the right of our citizens in southwestern portion of our county, our fiscal court at its April term appointed Esq. T.A. Yandell, A.S. Hard, and Judge J.W. Blue, to confer with Lyon county’s Commissioners. By appointment, they met at the Free Betty ford on the 17th inst., to consider whether any bridge should be built, and if so, at what point. The Lyon county representatives announced that they had no authority to consider any bridge for Dycusburg this year, but that Lyon county is prepared to build a bridge at the Free Betty ford, or what is known as Bishop ford. A large crowd had gathered, and it was decided to leave the location to the crowd, upon a vote being taken, after various ones had spoken in favor of Free Betty ford, it was found that every one on the ground was in favor of Free Betty ford except two. The Commissioners then decided to recommend the building of a bridge at Free Betty ford by Lyon and Crittenden counties. The citizens of that immediate vicinity provided a barbeque dinner and other refreshments, which everyone present enjoyed to his fullest capacity. After dinner Senator N.W. Utley, of Eddyville, opened the discussion by making a rousing speech for Good Roads. He was followed by Judge Blue, Judge Gray, County Attorney Hodge, of Lyon, Hon. John L. Smith, of Kuttawa, Hon. W.B. Yandell, of Marion, Judge Dobson, of Fredonia, and Charles Jackson, Esq., of Lyon county. All were enthusiastic in their demands for better roads and for a better system of working and making roads. From the general discussion of the matter by those on the ground that day from Caldwell, Lyon and Crittenden counties, it would seem that the day is not far distant, until the people of these counties will vote a bond issue sufficient to build good turnpike roads in all these counties. Hon. M.F. Pogue, Democratic candidate for Legislature in Crittenden and Livingston counties, was present and also made a talk in which he stated that the question would in all probability, be, before the next Legislature in a bill providing for state aid to those counties issuing bonds. If such a law is passed, we will have to vote bonds to protect ourselves. The Committee on Free Betty Ford for Crittenden Co-Esq. T. A. Yandell, Esq. A. S. Hard, and Judge J. W- Blue Jr., Judge T. P. Gray for Lyon Co., met in the County Judge office Tuesday and awarded the contract to the Champion Bridge Co., of Wilmington, Ohio at $1654.00. The Committee on Porters Mills, Esq L. J. Hodges. Co Att'y John A. Moore and Judge Blue met at the same time and place and awarded the contract to the Bridge Co, of Vincennes, Ind., at $1448.00. The following firms were asked to bid--Champion Co., Wilmington, Ohio., Oregonia Bridge Co., Covington Ky., Vincennes Bridge Co, Vincennes Ind., Penn Bridge Co., Beaver Falls Pa., Missouri Iron and Bridge Company, St. Louis Mo., York Bridge Co, Clarksville. W. Va., Roanoke Bridge Co, Cincinnati, Empire Bridge Co., Lexington Ky., Nashville Bridge Co., Nashville, Tenn., The Joliet Bridge Co., Memphis, Tenn., Attica Bridge Co., Louisville Ky., Brackett Bridge Co., Cincinnati, Ohio. The following firms did bid and the lowest bid was accepted in each case. Free Betty Ford Bridge bidders: Champion Bridge Co., $1654.00, Attica Bridge Co. $1820.00, Vincennes Bridge Co. 1687.00. Awarded to Champion Bridge Co.
Porters Mill Bridge bidders: Attica Bridge Co., $1632.00, Champion Bridge Co., $1495.00, Vincennes Bridge Co, $1448.00. Awarded to Vincennes Bridge Co. The people of those sections which are to have these new bridges are to be congratulated as they have long stood in need of them. The contracts call for the completion of both bridges by Dec., 1st of this year. -A drummer feel head-foremost into the creek as he was crossing Free Betty ford last week. He says we need a bridge. -The roads were never worse. It is almost impossible to haul over them. -The Free Betty ford is cleared off again. All who want to cross now, can do so. -Judge Gray, of Eddyville, came out to Free Betty ford Saturday and reviewed as satisfactory the abutment to the bridge on his side of the creek. -The fills at the bridge of the Free Betty ford across Livingston creek, are in and everything is now ready for travel.